I love being a food blogger. It is a creative and inspiring process and I never want to do anything else with my life! One of the unexpected aspects I love about it is that there is the most amazing foodie social network out there-not just with other bloggers, but with brands and restaurants. I'm building relationships with some inspirational companies and one of these is a small group of restaurants called Pho. They contacted me a few weeks ago as they love Slice Of Slim, and invited me to sample some of their low-fat dishes. They even have all their nutritional information on their website now-fantastic! This means that you can work out the propoints and see the calories before you even get there-which is exactly what I did! 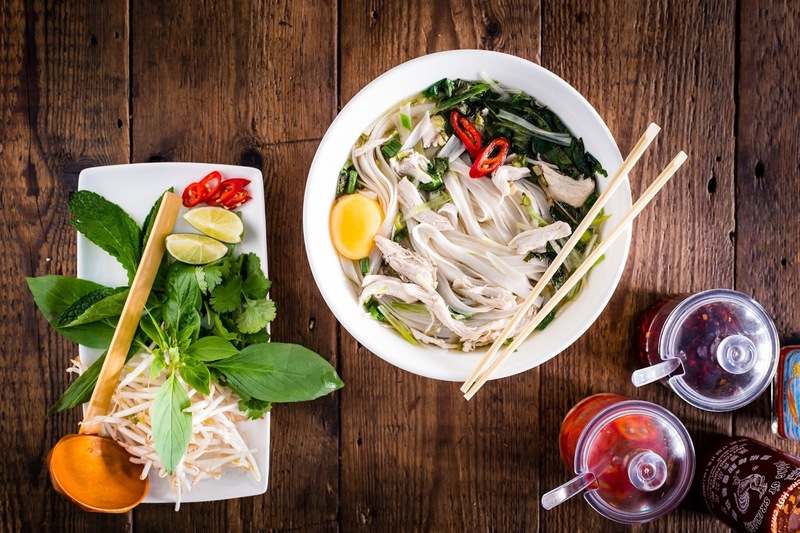 Pho opened its first restaurant in Clerkenwell in 2005 as London's first Vietnamese street food restaurant. It's family run, small, informal and serves great value, deliciously healthy and authentically prepared Vietnamese food. They now have 9 restaurants in London, one in Brighton and one in Leeds. As someone living the WeightWatchers plan on a daily basis, when eating out it is so refreshing to experience wonderful, freshly prepared food which is both filling and economical on propoints/calories. It makes a real change to try somewhere new that is not just another one of the large chains. If you find yourself in any of the areas where there is a Pho restaurant, I can highly recommend it. I went to the Soho branch on Wardour Street. As with all Pho restaurants, it's an informal, cafe-style atmosphere. You can't book, so you just walk in off the street. It is popular so unless you mind waiting, try and choose less busy times. This particular branch is open from 12-11pm every day and 12-10pm on Sundays. The branches vary so check the website HERE before you visit. The manageress, Magda gave me a warm welcome and sat me down in a sunny table by the window-perfect for taking photos. She allocated me top waiter, Troydan, who was not only enthusiastic about the food but extremely knowledgeable and was able to advise me on certain dishes and how to eat them. Even though I'd been to a Pho restaurant in Brighton before, it was great to be recommended dishes I may not have tried otherwise. While I was perusing the menu, I ordered a fragrant jasmine flowering tea. Now, some real tea connoisseurs may say this is a gimmick but I'm a real sucker for these hand-tied pretty tea balls that, on contact with water, open up before your very eyes to form this beautiful work of art in a cup! This is one of my favourite dishes. Even though us weight-conscious foodies tend to shy away from the fried stuff, this generous starter worked out to only 5pp/196kcal, which was worth every morsel. ..or pour over the crispy squid. Hot, crisp, spicy, pungent- if I could live on this dish for the rest of my life, I honestly would! They come in Veggie, Prawn or Chicken options. I went for the prawn. These were only 3pp/115kcal for the whole, generous portion. I tried both dipping sauces-sweet chilli and peanut which are 2pp/70kcal per dish but I used a really small amount. I'd charge 1pp/40kcal extra for the sauce if you use sparingly. The Summer rolls are cold, deliciously refreshing and so fresh. Not only were they stuffed with succulent prawns but also with generous strips of julienned carrot, cucumber and fresh mint-amazing! If I had known how large my main dish was going to be, then one starter would definitely have been plenty! These work very well as sharing dishes. This was 6pp/219kcal including the dressing. It cost £6.75-amazing value for a main course. Stir-Fried Water Spinach in Garlic. I called this 1pp as I only needed to charge for the oil. It's 172kcal but you could easily share this dish with someone else. I would never have thought to order the spinach but this hot side dish with the cold salad was the most incredible combination! I thought I made a tall 'Pile-it-High' salad, but this beats mine hands down! This is a dish I am definitely going to recreate for the blog sometime soon. ...and the spinach was toasty and warm with sesame and garlic flavours-AWESOME! I couldn't finish everything as I over-ordered, but I hope you can see that you can eat extremely well here without using huge amounts of your daily propoint/calorie allowance. You walk away feeling full but in the knowledge that the food is full of fresh ingredients and prepared from scratch just for you. It's so healthy, low-fat and delicious. Before I sign off, I just want to highly recommend another dish that I have had on a previous visit to Pho. is a meal in itself...It's a clear broth containing noodles and the filling of your choice- brisket, steak, meatballs, chicken, prawns or vegetables. It's served with an array of fresh herbs and vegetables which you add into the soup-an interactive and fabulous eating experience! is 10pp/397kcal and costs £7.95. Infact, I was so exhilarated when I ate this dish that I created my own, inspired by my trip to Pho in Brighton a couple of years ago. I have to say that Pho is one of my most favourite restaurants to visit. It's casual, buzzy, reasonably priced and so healthy it's almost too good to be true-but it's real and I can't wait to go back!